All portions of the Total Lunar Eclipse event at SIU Carbondale will proceed this evening with the exception of telescopes on the observation deck. Ice on the observation deck currently makes the deck and stairs too slipery for safe use. All other portions of the event; the sidewalk telescope viewing on the north side of Neckers, the live eclipse stream in Neckers 240, and concessions will proceed as scheduled. Snow removal is complete on most sidewalks and parking lots on campus although several icy patches still exist. Use caution when walking on sidewalks and in the parking lots. A lunar eclipse is a spectacular sight where the Moon is gradually darkened as it passes into the Earth's shadow going from full to crescent, and eventually turning a dark shade of orange or maroon. The color of the Moon during a total lunar eclipse is similar to a sunset on Earth. In addition to the Moon, several interesting celestial objects will be visible this evening with the best deep sky viewing happening when the moon is fully shaded and the skies darken during totality. Free public astronomy observation hosted by the SIU Carbondale Physics Department and the Astronomical Association of Southern Illinois at the Neckers astronomy observation deck. Telescopes provided. Children accompanied by adults are welcome. Visible this evening: Mars, Uranus, the Moon, Great Orion Nebula the Pleiades. Free public astronomy observation hosted by the SIU Carbondale Physics Department and the Astronomical Association of Southern Illinois at the Neckers observation deck. Telescopes are provided. Children accompanied by adults are welcome. Visible this evening: Mars, Uranus, the Moon, Great Orion Nebula the Pleiades. Free public astronomy observation hosted by the SIU Carbondale Physics Department and the Astronomical Association of Southern Illinois at the Neckers observation deck. Telescopes are provided. Children accompanied by adults are welcome. Visible this evening: Mars, Great Orion Nebula the Pleiades. Friday, July, 12, 2019, Southern Illinois Summer Star Party @ the SIU Farms. Campus and community groups can arrange special observation on campus, or we can bring telescopes to you. To make arrangements, contact Bob Baer at 618-453-2729, rbaer@physics.siu.edu. The observation deck is 624 square feet in size. It is built out of 2" thick rubber matting for vibration isolation. The primary telescope is a 14" Meade LX600. This computer guided telescope is used for all observation events as well as the lab portion of PHYS 103 (Astronomy). Several additional scopes are setup for observations as needed including Celestron 8" SCTs, a Coronado SolarMax II, and a Stelarvue SV105 Raptor (105mm refractor). 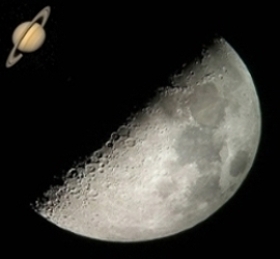 The most spectacular viewing is of the Moon and major planets such as Jupiter, Saturn, Venus and Mars. On clear nights, you can easily see the rings of Saturn and detailed striations on Jupiter. Brighter objects such as the Great Orion Nebula, the Andromeda Galaxy and several clusters are also visible visually. Dimmer deep sky objects are typically only visible during evenings with low humidity and not much cloud cover. On select night, deep sky cameras are utilized to display images of objects otherwise not visible though visual observations. Mars Opposition Star Party 2018. Star party at the SIU Farms for the Mars Opposition. See photos of the event on Bob Baer's Flickr photostream. June 5, 4:00pm - 10:30 pm. Special daytime solar observation - Transit of Venus. If you missed the transit, you can see photos of the event here. Special thanks to the Astronomical Association of Southern Illinois as well as all the people who turned out and helped out on the day of the event. Located on the South West (A-Wing) roof of the Neckers building at 1245 Lincoln Drive. Closest parking in the lot between Neckers and the Public Policy Institute. Enter the building through the west doors facing the parking lot. Take the stairs up to the fourth floor. Meet outside Neckers 456 or follow the signs from there up the South West stairwell. Located on Autumn Point Road, Carbondale, IL 62901. GPS Coordinates. 37.7098, -89.2550. Enter the site from the Chautauqua road, Site has 10 concrete telescope pads, an open observation area, and parking.